Common pantry ingredients (beets, red cabbage, turmeric and vinegar) are all that's needed to create delightfully colored eggs for the Easter basket. Hard boil the eggs: put eggs in a sauce pan in a single layer, cover by 1/2 to 1 inch cold water and bring to a boil over high heat. Cover, remove from heat, and let stand 10 minutes. While the eggs cook, prepare dyes. RED DYE: shred beet, cover with water and boil for several minutes. Add 1 tablespoon vinegar and set aside. BLUE DYE: shred red cabbage, cover with water and boil for several minutes. Add 1 tablespoon vinegar and set aside. YELLOW DYE: mix turmeric in 1 cup warm water, stir well and add 1 tablespoon vinegar and set aside. Divide hard boiled eggs among the containers of dye. 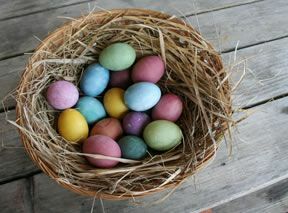 If possible, put dyes in tall narrow containers, like tall glasses so several eggs can be completely covered at once. 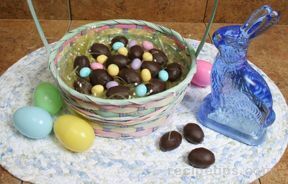 Leave eggs in dye until desired shade is reached, then carefully remove, and let dry completely. 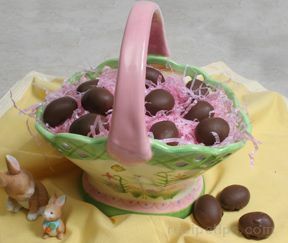 Colors can be deepened by redying a dry egg in the same color. To make GREEN, submerge a dry yellow-dyed egg in the cabbage (BLUE) dye. To make PURPLE, submerge a blue-dyed egg in the beet (RED) dye. Make multi-colored by only partly submerging eggs in various dyes. This is a good project to involve children in, since all materials are safe and edible. Be sure, though, to refrigerate eggs (right in the dye bath) if you wish to dye for longer than an hour or two. TIP: Look for turmeric in the spice section. If fresh beets are not available, use canned--but the color will not be as intense. "Alyssa C. has suggested to try kale, turmeric, yellow onion skins and honeybush. Do you have others? Thanks Alyssa!"